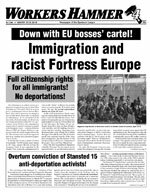 The following letter and response are reprinted from Workers Vanguard (no 1138, 24 August 2018), newspaper of our comrades in the Spartacist League/US. Reading the ICL international conference document last summer, I initially drew the conclusion that as a general rule Leninists should not simply uphold the right of oppressed nations within multinational states to self-determination but affirmatively champion their national liberation. But then I considered the case of Scotland (and Wales — are there others?). The peoples in these countries are certainly oppressed within the United Kingdom. Yet despite having an active independence movement, Scotland is hardly mentioned in the conference document as published. In the 2014 referendum, the ICL, while supporting Scotland’s right to self-determination, did not advocate either a yes or no vote on the question of independence. Assuming the party maintains this position, I would like to know on what grounds it does so in light of its new approach on the national question, and, more generally, when (barring cases of interpenetrated peoples or those where self-determination is legitimately subordinated to other questions) is it correct on true Leninist principles merely to defend an oppressed nation’s right to self-determination without calling for that right to be exercised by way of the formation of a separate national state. In particular, does the new methodology retain or abandon the principle adduced in the Workers Hammer article on the Scottish referendum that support for independence in a given instance should depend on “the depth of national antagonism” between workers of the nations in question? To back up its conclusion that national lines in Scotland are not hard enough at present to warrant advocating separation, the article cites opinion poll numbers, which strikes me as circular: is it only principled to call for a yes vote on an independence referendum when that side is bound to win? For that matter, hasn’t the independence movement in Quebec lost a couple of referendums over the years? To be clear, I am not necessarily suggesting that the party revise its position on Scottish independence, but merely asking, for my benefit and that of other readers, whether and to what extent the arguments formerly advanced for it are still judged to hold. Let me also request an article or series of articles on how the Marxist program on the national question developed historically to replace those by Comrade Seymour repudiated in the conference document. Alan refers to the main document from the International Communist League’s Seventh International Conference, “The struggle against the chauvinist hydra”, which details the fight in our party against a longstanding perversion of Leninism on the national question (see Spartacist [English-language edition] no 65, Summer 2017). The document stressed that for the oppressed nations of Quebec, Catalonia and the Basque Country, which have waged bitter struggles, some going back centuries, against their forcible inclusion in multinational states (Canada, Spain and France), communists must fight for their independence as the only correct application of the right to national self-determination. Alan asks whether this methodology requires correcting the line the Spartacist League/Britain took in the 2014 referendum in Scotland, in which our comrades supported the Scottish people’s right to decide for or against independence but did not advocate one way or the other. That position is consistent with Leninist principles and does not contradict the ICL’s recent conference decision. The right to self-determination — ie to political secession — also implies that a nation may choose not to separate. As for opinion polls, they can be an indication, though sometimes distorted, of national sentiment, but they are far from the only criterion for Marxists. The key differences between Scotland and Quebec (as well as Catalonia and the Basque Country) are rooted in their respective historical development. Quebec was conquered militarily and occupied by Britain following the defeat of the French on the Plains of Abraham in 1759 and further subjugated with the suppression of the 1837-38 Patriote Rebellion. The modern Canadian state is founded upon Anglo-chauvinist oppression of the francophone people and retention of the historically Catholic Québécois nation within its borders. Quebec’s resistance to forcible assimilation has centrally been expressed through defence of the French language. In contrast to the conquest of Quebec — not to mention Ireland — Scotland was co-opted as a junior partner in the British Empire. The 1707 Treaty of Union laid the basis for a two-way deal that was further sealed by the crushing of the 1745 Highland rebellion of the Jacobites, who were backed by the Catholic monarchy in France. In exchange for loyalty to maintaining a Protestant monarchy in Britain, Scottish merchants and aristocrats became partners in the empire’s accumulation of vast wealth through slavery and brutal exploitation of the colonial masses. Scottish regiments became an essential part of the empire’s military, serving in the bloody defeat of the French in Quebec and helping enforce colonial rule over India and elsewhere. Bolshevik leader VI Lenin summed up the Marxist programme on the national question as: “Complete equality of rights for all nations; the right of nations to self-determination; the unity of the workers of all nations” (“The right of nations to self-determination” ). To apply this programme in the concrete, each case of national oppression must be examined in its particulars and in historical context. In this regard, the depth of antagonism between the working classes of the oppressor and oppressed nations is important. There are precious few examples of common class struggle across the national divide between the working classes of English Canada and Quebec. But the history of the British working class is very different. Scottish workers, unlike their lords and masters, did not profit from the empire and from early on were pitched in battle against the British ruling class, Scottish as well as English, forming bonds of solidarity with workers throughout Britain. From the militant strikes that took place in the aftermath of both World War I and the Russian October Revolution to the miners strike of 1984-85, a great many of Britain’s major class battles have been waged together by Scottish, Welsh and English workers, mainly as members of the same trade unions. Scottish and Welsh workers have often played a vanguard role in these struggles. This was in spite of the betrayals by trade union bureaucrats and Labour Party leaders who, like Jeremy Corbyn today, were loyal to the reactionary United Kingdom and refused to uphold the right of Scotland to self-determination. The first half of the 1970s saw tumultuous strikes throughout Britain, including by miners, that brought down the Tory government of Edward Heath. Against this backdrop, the SL/B’s 1978 founding document stated: “We are for the right of self-determination, but call on the Scottish people to exercise that right by choosing to stay in the same state as the other peoples of Britain” (Spartacist Britain no 1, April 1978). On the other side of the coin, in the context of mass demonstrations against NATO cruise missiles in Britain in the early 1980s, the SL/B evocatively called for a “Scottish workers republic as part of the USSR”, demarcating ourselves from the anti-Soviet, pro-Labour, Unionist politics of the reformists. National lines hardened under the Thatcher government in the 1980s, particularly following the defeat of the miners strike. On top of the destruction of manufacturing, which had devastating consequences in Scotland, the Thatcher government imposed a hated poll tax first on the Scots, considered a “lesser people” by English chauvinists. Westminster’s contempt gave new life to Scottish nationalism, which had been marginal during the heyday of the empire. Above all, the Labour Party’s adoption of Thatcherite policies, especially under Tony Blair, drove many Scottish workers into the arms of the nationalists. In 2014, Tory prime minister David Cameron agreed to an independence referendum, arrogantly assuming an overwhelming vote for the Union. The unexpectedly close result (55 per cent against and 45 per cent for independence, with 85 per cent of the electorate voting) was a slap in the face to Westminster. We recognise that the Scots may well opt for separation in the future, in which case we would support that outcome. The struggle for national liberation can be expressed in anything from fighting for language rights to popular insurrections. The fact that the Spanish government tried to brutally crush the most recent Catalan referendum last October and behead the nationalist movement is just the latest confirmation that independence is the only way for Catalonia to be liberated from Castilian oppression. As the situation with Scotland continues to play out, we will maintain our defence of its right to determine its own course as part of our struggle against the oppressive United Kingdom and for a voluntary federation of workers republics in the British Isles. With regard to further readings, we recommend that our readers begin by studying Lenin’s writings on the national question, as our party did in hammering out the programmatic substance of the international conference document.